Jamie left a comment on yesterday's post with an idea. 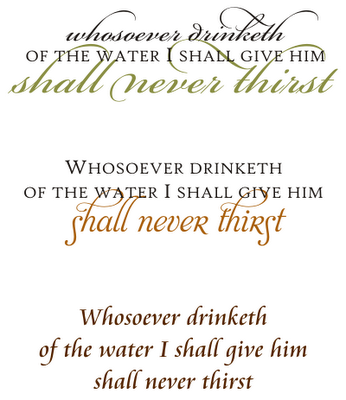 She has a drinking fountain in her home and she'd like to add the verse "Whosoever drinketh of the water I shall give him shall never thirst" above it. Isn't that a fabulous idea? It got my creative juices flowing (yes, pun intended, ha! ); here are a few design options so far.